Michael Norman and his Vista Murrieta High School track teammates have been here before -- and there's every reason to think they might finish on top again. 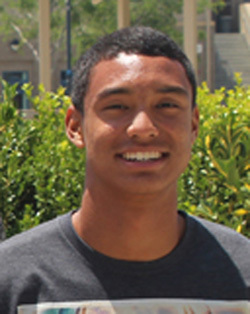 Norman will compete in the 200 meters and 400 meters and is eligible to compete in two relay races this weekend at the CIF State championships, which begin today in Clovis. The Broncos are the defending state champions and are in good shape to repeat, with their senior sprinter leading the way. Last year, Norman was named the Gatorade National Track and Field Athlete as a junior (left) after winning state championships in the 200 and 400, breaking state records in both events (20.30 seconds, 45.19). His time in the 400 broke a 30-year-old record and was the fastest time by any high school athlete in the nation. This season, Norman lowered his 200 time to a blazing 20.23 in last week's CIF Masters Meet at Cerritos College. He also ran 46.21 in the 400 last week, completing a double he felt was necessary to redeem himself after "disappointing" performances in the CIF Finals the week before. "I felt a lot lighter and quicker than the week before," Norman said. "I knew I had to redeem myself from the week before." Norman said he has worked well with coach Coley Candaele in pacing himself and developing a strong strategy this season to be ready for the big meets at season's end. "We plan out the regular-season races and we know when I have to have the big performances," Norman said. "The plan was to run fast at Arcadia (Invitational) and the CIF Finals. Unfortunately, going into the Finals I taxed myself a bit too much in weight workouts and I had a cold. I felt kind of sluggish." That was not the case last week, and Norman appears poised to be in top form in tonight's preliminary heats. The schedule has been altered to run races later in the evening because of extreme heat that is expected in Clovis. Once the state meet is over, Norman will continue training with an eye on the U.S. Olympic trials in Eugene, Oregon in July. But first things first.